Last weekend we had some good friends over to hang out and let the kids play. We do this a lot on Friday nights, but this time instead of the normal dinner, we opted for "dinner for breakfast." It was fun to break out of our normal Friday night dinner routines and it's so much easier to have time to make a large breakfast feast when you don't have to drag yourself out of bed! **Feel like a shortcut? Just use the canned apple pie filling and skip peeling those apples... or substitute peached (canned or fresh). Any fruit will do! We will be having that for breakfast in the morning! We have guests in town and this will be perfect! I have all the ingredients!! So pumped! Thank you! Mmmm. 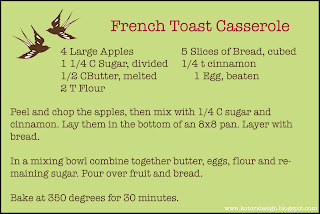 My husband loves frech toast and I love apples. I will have to try! OMG, what a heavenly recipe. So making it next weekend! Tonya, you can be sure I will be making this on the coming weekend!